Mother Nature is unpredictable, exciting, occasionally challenging, but often inspiring—and the same can be said of D-E. When you bring together a diverse community of individuals of different ethnic, racial, cultural, religious, and economic backgrounds and a variety of life experiences, you are going to get multiple perspectives, contradictory ideas, unexpected synergies, and unique collaborations, creations, and innovations. And this is good! This is exactly what we are intentionally seeking to create: an environment rich with opportunities to learn from one another, value our diversity, and, in the process, build empathy and understanding. Even our youngest students are taking the time to appreciate and listen to each other’s stories. 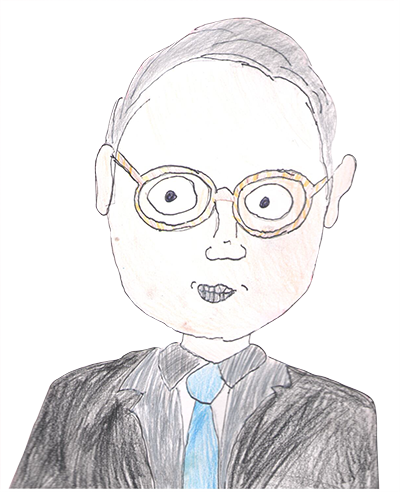 Zoe Berger ’28, as part of the Grade 2 “Community Connections” project visited me in my office in Leggett Hall to interview and then draw a picture of me (see right side). For my part, I was delighted to hear about Zoe’s perspectives as a Lower School student and I was able to appreciate my own background that much more. Our Bulldog mosaic (see below), currently installed in the Klein Campus Center window facing Leggett Field, symbolizes how all of us as individuals make a community that is impressive and altogether incredible. 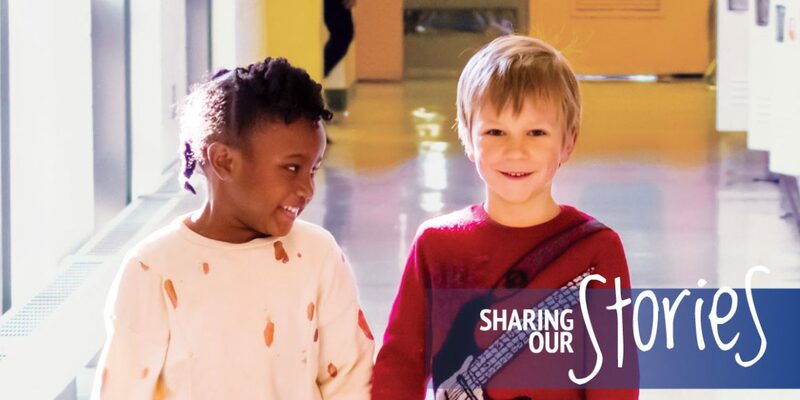 This issue of the magazine provides examples of how each division of the School is celebrating the sharing of stories. You will also enjoy reviewing highlights from our arts and athletics programs; examples of our students, faculty and staff working to “make it better”; and photos and features of the many events, programs and activities that have made this 2017-18 academic year unpredictable, often exciting, sometimes challenging, but always true to the nature of Dwight-Englewood School. Looking forward to the warming months of the spring! There are no photos with those IDs or post 382 does not have any attached images! The D-E Bulldog “mosaic” symbolizes the idea that we all have a unique, individual story to contribute to our community of learners, and yet we are still a community of one. The mosaic was created from more than 8,000 photos of D-E students, teachers, and staff members, taken during the entire 2016-’17 academic year. The D-E School Communications & Publications Team first created a master image at full size and then cut it into 6 parts. Then the team cropped and created mirror images of these source photos before feeding them into a software program that matches individual photo files’ pixel colors into separate master layout files. These files were then essentially stitched together to create one overall photo image (of the Bulldog Statue). The one overall photo image file was then printed on large format transparent adhesive film and installed on the outside of Klein’s tinted windows as three separate panels, using a scissor lift. After installation, a secondary sealant was applied to protect the adhesive film from the elements. The entire process involved processing 1 year of photos, 300 gigabytes of individual files, two months of planning, and 1 full week of rendering time to create!